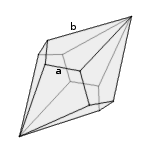 Calculations in regular tetragonal (4-) and pentagonal (5-) trapezohedrons. The number n of the trapezohedron refers to the number of faces of one half. A trapezohedron (or deltohedron) is a bipyramid, that is twisted in itself for 180°/n. 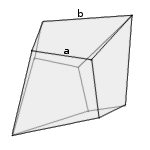 A regular trapezohedron is the dual body of a unifrom antiprism. The faces are 2n deltoids. Choose the type of trapezohedron (4- or 5-), enter one value and choose the number of decimal places. Then click Calculate. Edge lengths and height have the same unit (e.g. meter), the area has this unit squared (e.g. square meter), the volume has this unit to the power of three (e.g. 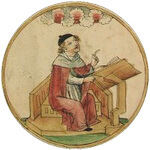 cubic meter). A/V has this unit -1.